David (Matt McGrath) and Caroline (Lea Thompson) rehearse a number from his play "Petz." T. Charles Erickson photos. Will (Will LeBow) is the ghost in the attic. Caroline in her silly canine space suit. David and Caroline in a sleep over his first "with a girl since high school." At home in the attic with the ghost which only Caroline can see. Caroline convinces Mimi (Brenda Wehle) to take her father’s hand. Directed by Amanda Charlton; Scenic Design, Andrew Boyce; Costume Design, Emily Rebholz; Lighting Design, Jake DeGroot; Sound Design, Bart Fasbender; Original Music, Kyle Jarrow; Production Stage Manager, Libby Unsworth; Production Manager, Joel M. Krause; Casting, Melcap Casting. 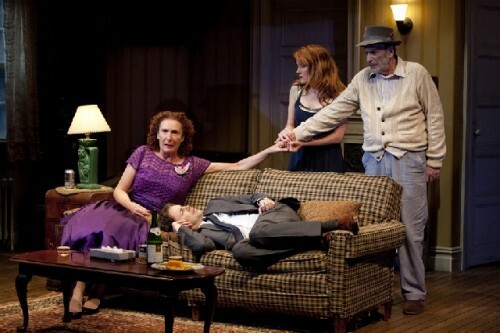 The Actors: Will LeBow (Will), Brenda Wehle (Mimi), Lea Thompson (Caroline), Matt McGrath (David). The third and final world premiere for the Nikos Stage "Caroline in Jersey," by Melinda Lopez, which opened last night, is a winner. If heart and soul, as well as compelling performances by characters we really care about, are any measure this is sure to be a play with legs. While Caroline may be languishing in Jersey, at least through August 16, she is surely bound for bright lights and the big city. In crossing the Hudson River from Joisey to Manhattan, however, like all new plays, this diamond in the rough will take a bit of polishing. Particularly in the final scene of the second act which seems rushed and unresolved. As much as we loved and felt for these wonderful characters Lopez needs to clean up some of their back stories. When it comes to motivation we are not always in sync with why the actors are behaving as they are. There are loose ends to tie up but this was a sprightly and compelling evening of theatre. There is a ghost in the attic. Literally. As Caroline (Lea Thompson), a down on her luck actress, who "temps" for a legal firm, finds out after she convinces Mimi (Brenda Wehle) to rent the grungy attic (designed in all its grime by Andrew Boyce). It was formerly the apartment of her parents, who died under questionable circumstances, and has been abandoned for a decade. The problems with the script manifest themselves immediately. At the bottom of a bag with her hastily thrown together earthly possessions Caroline produces an ad for the apartment. Mimi is skeptical as she has not advertised the apartment. So the clipping may be ten years old. Just how Caroline came across it is never clarified. The landlady is not anxious to rent. We learn why slowly but never entirely satisfactorily. She wants to know if Caroline is "another" reporter. Clearly something really bad has happened in that attic but Mimi offers no specifics. She can use the money and after a bit of haggling agrees to take $650 as advertised . Caroline suggests it will pay for two weeks. By Manhattan standards even $1,300 a month is a bargain. Mimi agrees but lays down the rules. She will come knocking on the door when they are violated. Another trope of the play. Caroline is desperate. Her husband, a director, has been cheating with a teenager who is now pregnant. There are pathetic late night phone calls. Again the back story gets a bit muddled. It seems they lost a child, Molly, in infancy. How and why is never clear but it messed up their marriage. She still clings to this love as well as a fading hope of finally making it as an actress. Her gay friend David (Matt McGrath) writes terrible plays. Caroline is to appear as the dog "Laika"which perished in space during the Russian launch of Sputnick II. Some of the brightest spots occur when they rehearse her hilarious song for his musical "Petz." There are jokes about how it compares to "Cats." It seems that David is, at best, a derivative playwright. In the second act it is more absurd when she returns home from a rehearsal, a no no, in her canine space suit. Thompson is a gamer in allowing herself to appear so silly. Clearly Thompson will do just about anything to make the play work. Her performance is warm and compelling. We really, really, really want to love her. The ghost in the attic? Ah yes. It seems that the parents of Mimi enjoyed playing the piano. Particularly her mother. We are never sure how and why Will (Will LeBow) her father died. Was he murdered? By whom? Mimi emerges as a suspect. Or was it suicide? Did Will kill his wife? Was it an act of euthenasia? Again, murky. It emerges that he was a crook and accountant. With high profile clients including a "Made Man" (this is after all Sopranos turf) and the playwright, Arthur Miller. There are tons of play within a play references. Will, from 'Death of a Salesman" channels Willy Loman. Something about what happened in Boston. Caroline, constantly reaching for a line, often quotes from Shakespeare. In the Lopez script there is a lot of theatre about theatre. Will is lingering on in the attic to play the piano. Nobody can see him, except Caroline. It seems he hangs out in the refrigerator. There is a gag line about how it keeps him fresh. He is constantly appearing and disappearing. Gradually he and Caroline bond. He may be dead, but what the heck, Caroline is lonely. Who else to talk to at 3 am having killed off a bottle of tequila? Those phone calls to the ex get nowhere. But David, now and then, can be talked into a sleepover. Overall, Will makes a charming and sympathetic ghost. 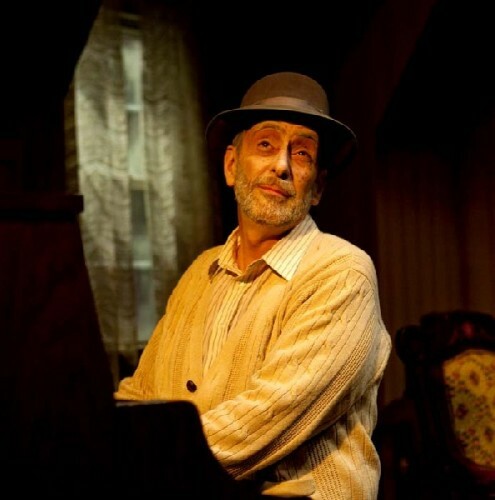 Having seen LeBow in many roles at American Repertory Theatre (50 productions over 17 years), most recently in a Mamet play "Romance", we never cease to be enthralled by the range of his performances. But here we found another dimension as he played the piano with skill and invention. He even sings in that signature bass/ baritone which is so well known to appreciative Boston audiences. He accompanies Caroline in a hilarious rendering of her poochy pop song. This is LeBow's first WTF season and hopefully it will become an annual event. He is a great addition to the company. As the plot developed Caroline and David talked Mimi into crossing the river for opening night of his awful play. Mimi, complaining that she has nothing to wear, has rummaged through the closet. With misplaced comic intent Emily Rebholz has created a truly ugly, full skirted, purple, satin dress. Mimi ends up looking like a really hideous drag queen. It is not clear how she has morphed from the landlady from hell into new best friend and surrogate mother to Caroline. Get me rewrite. Nor is it convincing, when back in the apartment for a bit of the bubbly after opening night, Caroline wants her to embrace the hand of her father's ghost. In the final ten minutes the play catapults to a conclusion leaving the audience somewhat dumbfounded. What? While the plot lines get tangled into a Gordian Knot, Lopez needs to apply a sharp scalpel to cut through them. This is a wonderful play but still a work in progress. Clean it up, hold onto that fabulous cast, and send it Off Broadway. For heavens sake, get Caroline out of Jersey. She deserves better than that. "As with most shows at WTF this season, the acting has been good but the the scripts weak. True West would be the exception." "I saw it opening night and didn't have so many problems with the plot line. Caroline had a miscarrage and can no longer have children. Will let his wife die rather than prolonging her illness by allowing Mimi to call for help. Mimi didn't reconcile with her father before he died of a sudden heart attach. The landlady from hell was afraid that Caroline was only after her fathers illgotten gains. The whole thing is about unresolved issues and I loved that they got resolved in the end. Sorry you didn't like it."